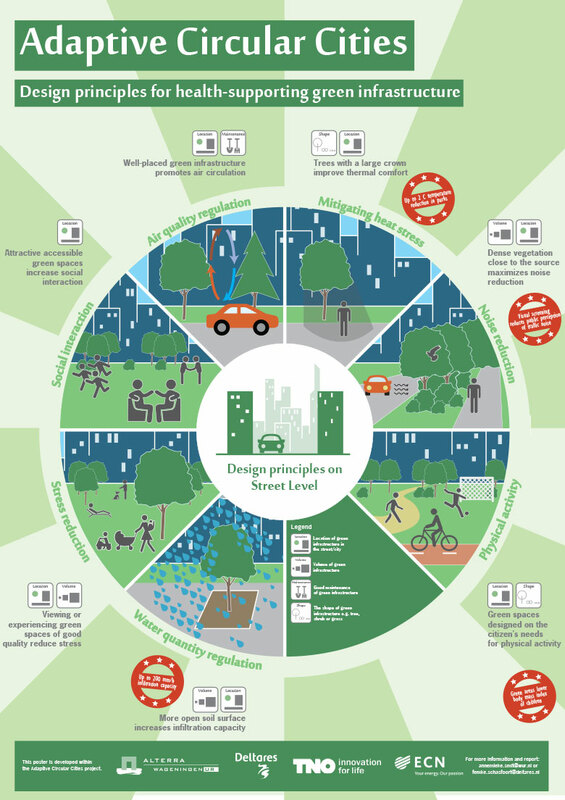 There is a growing awareness in cities throughout the world that green and blue infrastructure can offer a wide range of ecosystem services to support a healthy urban environment. For example, landscape architects explore possibilities in their design of the urban landscape to use the potential of green elements for regulating air temperature, air quality, water storage and drainage, and noise reduction. However, the potential benefits of green and blue infrastructure are probably only partially utilized because of a lack of both scientific knowledge and practical understanding of what these benefits are, and how green and blue infrastructure can best be implemented. Hence there is a need for a translation of scientific knowledge on the functionality of green and blue infrastructure into design principles and how to integrate these principles into the design of multifunctional green and blue infrastructure. The project focussed on developing concepts and design principles for blue and green infrastructure that not only support climate resilience but also contribute to a healthy and liveable urban environment. Also, a healthy and liveable urban environment contributes to the strengthening of the socio-economic climate in cities. First, the functional use of blue and green infrastructure was assessed on the basis of available literature and experience from the city of Utrecht. Secondly, design principles were formulated for the design of blue and green infrastructure in the urban landscape. The design principles are compiled in a number of infographics that provide information on the effectiveness of green spaces as part of the green infrastructure to deliver ecosystem services. A well-functioning blue infrastructure requires an integrated approach to create a network that prevents floods and droughts, and has a good water quality. This is essential because water is a dynamic substance which flows, evaporates, runs off the surface and leaches. Urban water quality may vary depending on the functional use. 3. Aesthetical aspects of water contributing to mental health. 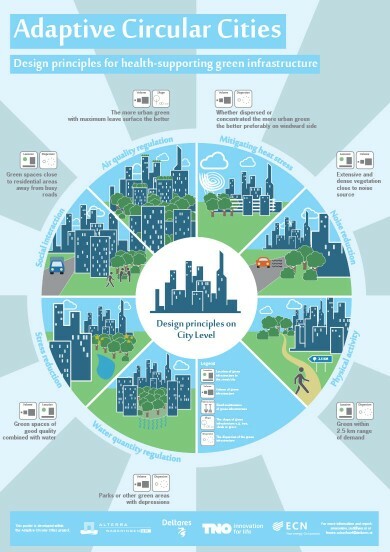 Design principles for healthy blue infrastructure are formulated within these three categories. In this study the benefits were shown for some of the ecosystem services of green infrastructure. This analysis will help to better compare green infrastructure with alternative (grey) infrastructures in cities, in this way supporting the decision making on investing in urban design. Benefits of blue infrastructure will be analysed in a follow up project.